The design of this building was the winner of one of three international competitions held in 1952 to provide stadia for the 1956 Olympic games. Architects Kevin Borland, Peter Mcintyre, John and Phyllis Murphy and their engineer Bill Irwin won the only one of these competitions to be consummated. Construction began in October 1954 and the building was completed in 1956. The former Olympic Pool is of historical, architectural and technological significance to the State of Victoria. The former Olympic Pool is of historical significance as the only major stadium structure remaining from the 1956 Olympic Games (after the demolition of the Olympic stand at the MCG). The pool was a major focus of activity during the games. The former Olympic Pool is of architectural significance as an early and influential landmark in the development of Structuralist architecture in Australia in the post-war period. The winning competition entry was acclaimed at the time as a brilliant and original design which would be influential in Australia and overseas. The former Olympic Pool is of scientific (technological) significance as an early example of pre-tensioned steel frame construction. 2. The building shown as B1 on diagram 1977 held by the Executive Director, including all of the remaining fabric of the Olympic Pool building as finished in 1956. 3. The Arthur Boyd sculpture shown as S1 on Diagram 1977 held by the Executive Director. The present Olympic Park was reserved for Government use in Robert Hoddle's 1837 plan for Melbourne and East Melbourne. The earliest formal sports facilities in the Government Reserve were the Melbourne Cricket Ground (MCG) and Richmond Cricket Club Ground, both built in 1853. The site of Olympic Park was then swampy ground. In 1857 the Zoological Society established Zoological Gardens on the subject site, but these were relocated to Royal Park in 1862 and Friendly Society Gardens were established on the site. In 1862 the Board of Land and Works recommended that the 'unappropriated portions of the area known as the 'Richmond Police Paddock' [that] comprised about one hundred and sixty acres be temporarily reserved for public recreation'. In 1867 it was recommended that it be 'temporarily reserved for the purpose of a Public Park with the designation of Yarra Park'. 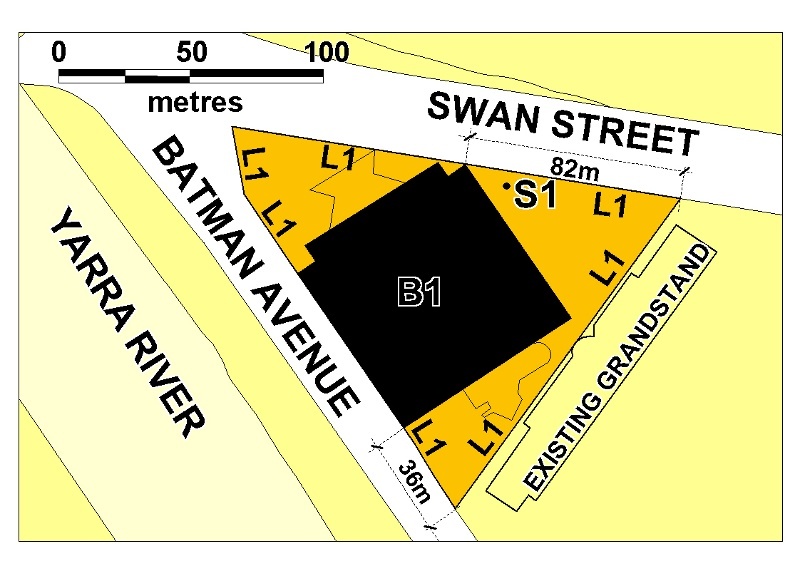 In 1875 Swan Street was extended through the park westward as far as the river. In 1875 157 acres of Yarra Park was officially set aside as parkland by the Board of Land and Works. Domestic farm animals continued to be grazed on the site. The use of the precinct for recreation and sporting activities was increasing from the 1890s and further infrastructure was developed to support these activities. Two ovals were established on the site of Olympic Park, which were used for cycling, running, and sports such as cricket and football. Yarra Park was proclaimed Crown land on 24 August 1909 and the precinct declared a 'site for the recreation convenience and amusement of the people and for a children's playground. In 1923 the Melbourne Motordome was created on the site, hosting car and motorcycle races, as well a several Victorian Football League (VFL) Grand Finals, wrestling matches and cycling. It was demolished in 1933 to make way for the new Olympic Park Speedway - the first use of the name 'Olympic' for the site, several decades before the Games. Olympic Park was taken over by the Australian Imperial Force in 1940 and was thereafter used for training and storage while also maintaining its use as a sporting facility where possible. The Speedway was demolished in the 1940s and in 1951 a fire destroyed a wooden grandstand at Olympic Park. The 1956 Melbourne Summer Olympics, officially known as the Games of the XVI Olympiad, were held in Melbourne in 1956. The 1956 Games were the first to be staged in the Southern Hemisphere, as well as the first to be held outside Europe and North America. Melbourne was selected as the host city by a one-vote margin over bids from Buenos Aires, Mexico City, and six American cities on 28 April 1949, at the 43rd IOC Session. Many members of the IOC were sceptical about Melbourne as an appropriate site. Its location in the Southern Hemisphere was a major concern, since the reversal of seasons would mean the Games were held during the northern winter. This was thought likely to inconvenience athletes from the Northern Hemisphere who were accustomed to resting during their winter. The problems of the Melbourne Games were compounded by bickering over financing among Australian politicians. Faced with a housing shortage, the Premier of Victoria refused to allocate money for the Olympic Village (eventually sited in Heidelberg West), and the country's Prime Minister barred the use of federal funds. As late as April 1955, the IOC was still doubtful about Melbourne. But construction was well underway by then, thanks to a $4.5 million federal loan to Victoria, but it was behind schedule. Egypt, Iraq, and Lebanon announced that they would not participate in the Olympics in response to the Suez Crisis when Egypt was invaded by Israel, the United Kingdom, and France after Egypt nationalized the Suez canal. Meanwhile, in 1956 the Soviet Union crushed the Hungarian Revolution, and the Soviet presence at the Games led to the withdrawal of the Netherlands, Spain, and Switzerland from the Games. Less than two weeks before the 22 November opening ceremony, the People's Republic of China chose to boycott the event because the Republic of China had been allowed to compete under the name "Formosa". Although the number of countries participating (67) was almost the same as in 1952 (69), the number of athletes competing dropped sharply, from 4,925 to 3,342. Once underway, the Games unfolded smoothly, and became known as the 'Friendly Games'. It was in swimming that the Australians really shone. They won all of the freestyle races, men's and women's, and collected a total of eight gold, four silver and two bronze medals. Murray Rose became the first male swimmer to win two freestyle events since Johnny Weissmuller in 1924, while Dawn Fraser won gold medals in the 100-meter freestyle and as the leadoff swimmer on the 4 x 100-meter relay team. A highlight was a hotly contested and violent water polo encounter between Hungary and the Soviet Union which became known as the 'Blood In The Water' match. The game became rough and, when a Hungarian was forced to leave the pool with blood streaming from a cut over his eye, a riot almost broke out. But police restored order and the game was called early, with Hungary leading 4-0. The Hungarians went on to win the gold medal. By 1950 doubt about the availability of the MCG as an Olympic venue led the Olympic Games Committee of Management to advocate for Olympic Park as a viable alternative, but the MCG was later approved as the Main Stadium for the Olympics. Construction of new facilities and upgrading existing facilities for the Games was a massive undertaking. Of the total of £2,400,000 provided by the Commonwealth and State Governments and the Melbourne City Council, £1,255,000 was to be expended on the construction of the facilities at Olympic Park, including four venues hosting swimming, hockey, cycling, athletics training and soccer, the latter being the current Olympic Stadium. The total cost was eventually to be £6,000,000. This is a State-owned area of 22 ½ acres of parkland, approximately a mile form the centre of the city and within 400 metres of the Main Stadium, and has been used for sport generally, but with few amenities. It was decided to redevelop the entire area, and plans were prepared for four arenas, Swimming (with separate diving pool), Cycling, Hockey, and Athletics, the grassed area within the athletic track to be used for preliminary football matches and the track itself for training purposes. It was eventually decided that there would be a Swimming Stadium and three others; one adjacent to it for Athletics and Soccer (Olympic Park Stadium), and stadia for cycling and hockey to the east (both now demolished). An Australia-wide competition was announced in 1952 for a design for the swimming and diving pool venue (the Swimming Stadium). This was originally intended to be located at Fawkner Park, but the outcry over the use of public parkland resulted in 1953 in the location being changed to Olympic Park. There were seventy two entries in the competition, and the winner was a design by five graduates of the University of Melbourne: Peter McIntyre, Kevin Borland, John and Phyllis Murphy and William Irwin (a structural engineer). The judging panel comprised Professor Brian Lewis (Chair), Robin Boyd, Bernard Briggs, Eric Hughes, Frederick Romberg (all architects), the Professor of Civil Engineering at Melbourne University A J Francis, and C J McDougall of the Master Builders Association. The Age in 1952 (30 December) noted the 'original and brilliant' winning design in which the architects 'made the basic elements self-supporting by taking the spread upper ends of the seating floors and tying them together by means of the roof'. Robin Boyd in 1954 noted that the design had two main claims to architectural interest: its ingenious and original structure, which reduced the amount of steel required and produced the 'startling elimination of all column supports'; the other was the way the pool was planned almost surrounded by glass. He also noted it was 'the first building ever to be hung from its own roof'. Its structure consists of opposing outward-leaning, concrete-encased lattice girders tied at their heads by the tubular steel roof trusses, supporting the tiers of reinforced concrete seating. 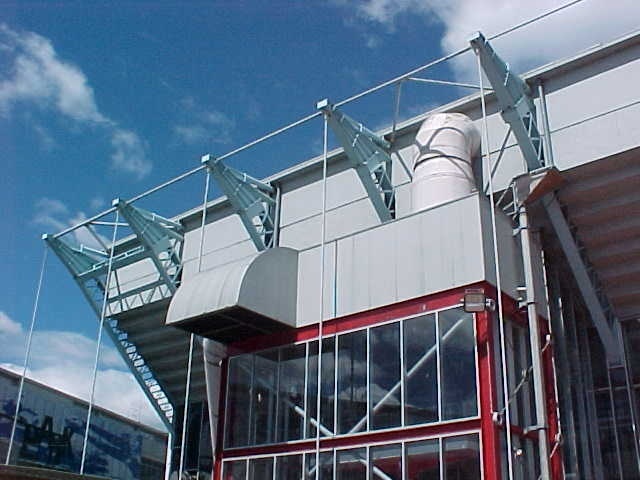 The vertical rods which feature externally brace the structure against swaying, and require periodical checking for tension. The huge ceramic sculpture at the north end of the building was erected and made by Mr Arthur Boyd. The swimming centre measured 263 x 290 feet (80.2 x 88.4 m) with a clear roof span of 73 m, and contained a swimming and water polo pool 50 m x 20 m, a diving pool 15.24 x 20 m and 4.88 m deep in the centre. This was the first time an enclosed separate diving pool had ever been used at the games. The design was unique and it was an outstanding engineering feat. It won accolades both as an Olympic venue and as an outstanding victory for modern architecture in Australia. It was a landmark in the history of Australian architecture and was probably the world's first prestressed steel building. 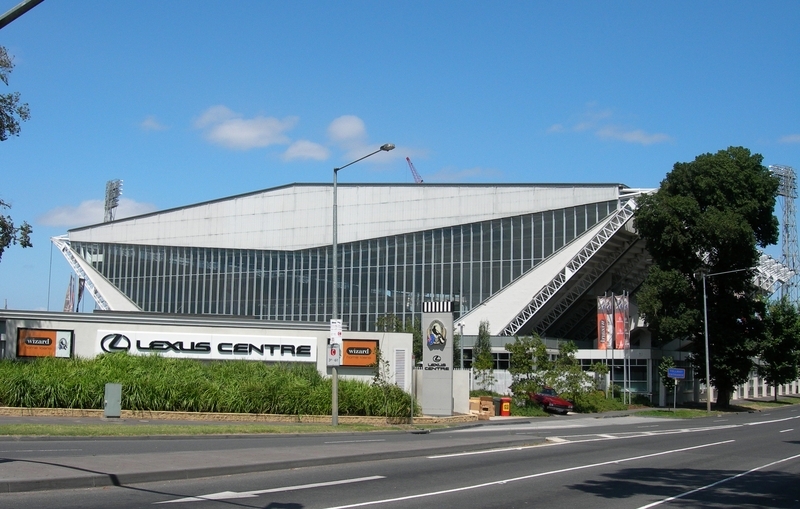 The pool continued to be used until 1980, when it was closed for alterations, reopening in 1983 as the Melbourne Sports and Entertainment Centre (also known as the Glasshouse). One of the original architects Kevin Borland (as Borland Brown) designed the alterations and additions. There were external additions, the pools were covered and a proscenium and stage was formed at the east end, obscuring the east window. From 2000 to 2002 the Centre was vacant. In c2000 further alterations were designed by Peter McIntyre. These included the removal of the 1980s additions, reinstatement of the glazed east wall, and the formation of a podium of ancillary buildings below the external concourse on the north, south and west sides. These house facilities for the Collingwood Football Club, the Victorian Institute of Sport and the Melbourne Vixens netball team. It is now an elite athletic training facility, with the auditorium housing a training area, a short sprint track, weights and exercise equipment, a pool (the former diving pool), and plunge and spa pools. This tall ceramic sculpture, about 35 feet high, stands on the concourse to the east of the swimming centre. It was commissioned from Arthur Boyd by the architects of the pool. Boyd, who was to become one of Australia's foremost painters, had worked in pottery from 1944-50, when he began to work mainly as a painter, while still experimenting with ceramic tiles and making ceramic sculpture. Phyllis Murphy noted that at that time Boyd was 'very hard up' and they wished to support him. The architects prevailed on the clients to allow money for a sculpture and Boyd was given a free hand to design the work, which was begun in 1955. A commission for a major piece of sculpture was extremely rare in the 1950s, but it was seen by the architects as an important aspect of their overall design - a simple vertical contrast to the diagonals of the seating. It was designed as a simple monolithic form, hollow in the centre, made up of bricks about 4-5 inches thick, which were fired and then glazed before a second firing. It was seen for the first time when it was assembled on site. Boyd worked on it for eighteen months, but was so keen to get the commission he had not quoted enough and ended up losing money on the commission. There was little public reaction to the completed work. The design was influenced by the contemporary work of Picasso, and bears marks of Boyd's stylistic preoccupations, for example in the dark figure of the ram-ox, symbolic of evil and lust and seen in many of his earlier paintings. Arthur Boyd is one of Australia's most important painters but the Olympic Pylon is his only piece of public sculpture, though smaller ceramic sculptures by him are held in a number of State Galleries, and his paintings are represented in virtually every public collection. This landmark of Australian architecture was designed by the architects Kevin Borland and John and Phyllis Murphy and the engineer Bill Irwin and was built in 1954-6 for the Olympic Games held in Melbourne in 1956. General Conditions: 2. Should it become apparent during further inspection or the carrying out of alterations that original or previously hidden or inaccessible details of the place or object are revealed which relate to the significance of the place or object, then the exemption covering such alteration shall cease and the Executive Director shall be notified as soon as possible. General Conditions: 3. If there is a conservation policy and plan approved by the Executive Director, all works shall be in accordance with it. General Conditions: 4. Nothing in this declaration prevents the Executive Director from amending or rescinding all or any of the permit exemptions. Nothing in this declaration exempts owners or their agents from the responsibility to seek relevant planning or building permits from the responsible authority where applicable. * Repair, maintenance or replacement of hard landscaping elements including gates, fencing, bollards, paving, kerbing, channels, seating, rubbish bins and other fixed and unfixed outdoor furniture. * All internal works to non-registered buildings.
. Erection of a 2.7 high statue of Bob Rose and podium in the north-west forecourt. The fabric of the 1956 building is of primary significance. The 1980 additions have little significance on their own, and have had considerable negative impact upon appreciation of the original building. Removal of these additions to restore the 1956 concept would be supported subject to appropriate reconstruction of missing or altered elements. Additions beyond the scope of the 1956 building, or removals of any 1956 fabric, will be subject to the permit application process. The registered land extent is intended to provide the opportunity to control the scale and appearance of proposed future developments which might impact on the setting or the appreciation of the Olympic Pool building. Existing buildings on this land other than the registered building are considered to be non registered buildings. Internal alterations are exempt but permit applications will be required for any additions or new independent structures. Removal of the existing asbestos roof cladding will be allowed through the permit process. The suitability of the new cladding material and of any alterations required for its mounting will be considered in assessing the permit.